Earlier this year, Moosend announced a series of releases for their 2017 roadmap. 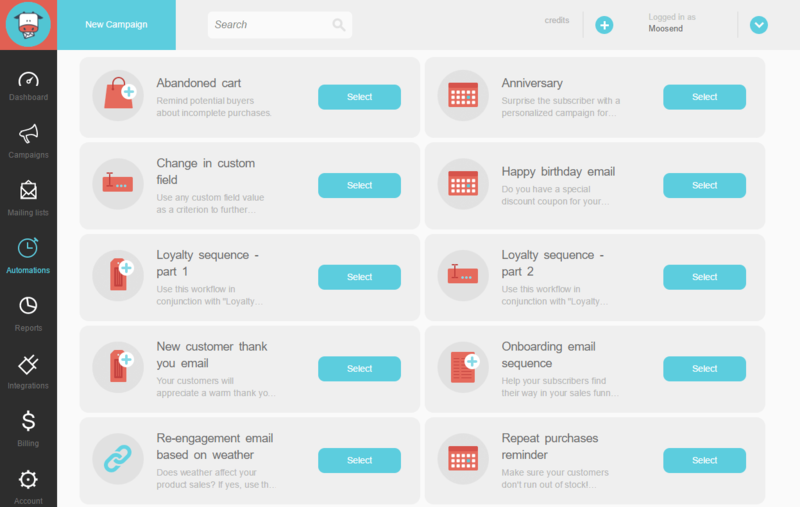 Following the redesigned drag-and-drop editor, the Moosend email marketing platform is now introducing its email automations and website tracking. The major features of email automations of Moosend include “click-and-create” automated workflows, pre-made workflow templates (called Recipes), and automated visitor tracking and profiling.Below is a quick animation explaining the marketing automation and website tracking of Moosend. Automations and website tracking are used to track customer journeys from start to finish and personalize the email campaigns they receive along the way. For example, if someone adds products to their cart and they do not complete their purchase, then they receive an abandoned cart reminder to proceed to checkout. Moosend introduces workflow templates called Recipes, for efficient automation design. Just like with regular recipes, marketers can customize the preset automated workflows either by adding more steps, or tailoring the existing ones. There are currently recipes set up for the most popular automations. Like for instance, Abandonned cart emails, Anniversaries, Birthday emails, Loyalty marketing sequences, Onboarding and welcome emails as well as Repeat purchase automations. assign positive or negative scores with every action customers take or don’t take. Users of the Moosend platform can now design their automated workflows on the built-in designer. They can choose from a list of triggers, conditions, and actions. Setting each workflow up occurs through an action list/action menu. Essentially, Moosend presents a workflow builder which helps the designing process and adds efficiency. Moosend’s automation platform is designed on a Triggers and Actions basis. The Triggers start an automated campaign, while Actions show what to do once a trigger is activated. Another important feature is being able to include conditional/control steps between triggers and actions when designing automations. Marketers can choose for triggers to be activated within seconds, hours, weeks or months from a specific time or date, or following a user’s action. Moosend also offers a control step that is based on external data, for instance, real-time weather reports . Email marketers can use this to send or select personalized email campaigns to their subscribers and make product recommendations based on weather conditions, as a way to increase conversions rates. Marketing automations allow for a range of actions beyond automating certain tasks. With Moosend’s system, you can set certain goals/milestones for your customers/subscribers in a specific mailing list. For instance set up an automation so that every purchase made to be adding a score of “1” to the customer’s total score. Then, a marketer can set up another automation for every customer who has a score higher than 20; they could either enter another mailing list with VIP customers, or qualify for a discount, offer, or an email sequence that grants them rights of another customer group. Similar to gathering miles with an airline company and upgrading your membership status. With Moosend’s website tracking component you track and identify visitors, logged-in users, ghost users. Also, it creates anonymous user profiles and automatically matches them to a specific segment, based on their online behavior. The marketing and website tracking features are available on the platform right now and included in all the Moosend plans, which include a free trial, monthly or pay-as-you-go based on the number of emails sent. Moosend is a powerful Email Marketing platform with the simplest interface in the market that doesn't break the bank.